We had a fun family trip to Draycote Water at the weekend. Jen is training for a 10km running race, so we thought that the 5 mile tarmac path would be ideal for her to run round whilst Owen and I rode round on my bike. I figured that Owen and I would be able to do two laps in the same time as Jen could run one – so we had a bit of a race! Team Bike were caught napping, literally – Owen had fallen asleep in the car on the drive over. Jen was able to get a good head start, whilst I got the bike and child seat ready and waited for Owen to wake up. When we got going I wasn’t sure how long it would take us to catch up with Jen, but we made good progress along the first dam thanks to a decent tail wind. However, when we hit the north shore the pace dropped, I’d forgotten how hilly the route was, the fact that I’d done a hilly 35km ride the previous day and was carrying an extra 15kg made the hills feel harder. I was still expecting to see Jen around each corner, but we eventually caught her up around the halfway point, and had a quick stop to have a drink and fuss over Owen. Leaving Jen, we continued our lap now into a headwind on the west dam I pointed out the wildlife to Owen, we saw geese, swans, rabbits and even a heron! On completing the first lap, we stopped for some photos, and to look at a swan and her cygnets by the dam. The second lap felt quicker, but taking a break had been a mistake, Jen was waiting for us at the end. As Owen had been such a good boy sat on the back of my bike, we took him to the playground, where he particularly enjoyed “driving” the jeep on springs. 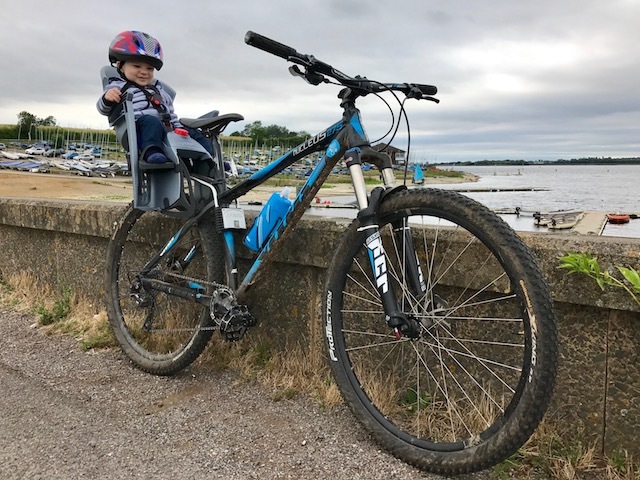 This entry was posted in Mountain biking and tagged Draycote Water, Owen, Photo, Strava, Warwickshire by Lewis. Bookmark the permalink.